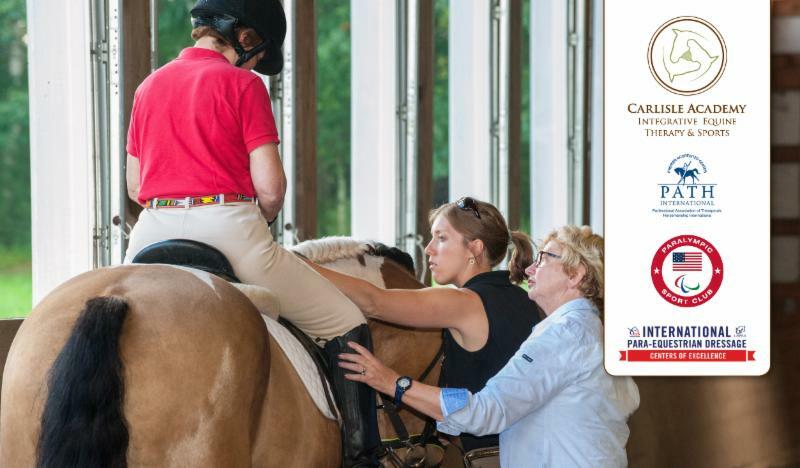 Lyman, Maine- May 22, 2017 – Carlisle Academy Integrative Equine Therapy & Sports, recognized as a USEF/USPEA National Para-Equestrian Dressage Center of Excellence, will host a Para Dressage/Dressage Symposium and Evaluation Ride Schooling Show June 2-4, with Hanneke Gerritsen. Hanneke Gerritsen is a FEI 5* Paralympic Dressage Judge and Deputy Chair of the FEI Technical Committee. Gerritsen will offer an educational and interactive symposium packed with information and training for riders and coaches. The symposium will be held at the Carlisle Academy located in Lyman, Maine. Friday & Saturday, June 2-3, 2017, includes the Dressage & Para-Dressage Symposium, followed by Sunday, June 4, Dressage & Para-Dressage Schooling Show. Para-dressage athletes, dressage riders, and interested veterans are encouraged to attend.For more information about dates, activities, or biographies please visit http://carlisleacademymaine.com/programs/sports-education/para-dressage-education-training/ or contact Sarah Armentrout, Head of School, at sarmentrout@carlisleacademymaine.com or 207-985-0374. Download the necessary forms below. This will be Hanneke Gerritsen’s fifth visit to Carlisle Academy. During the symposium riders will have 45-minute private mounted sessions each day along with lecture-based education. Trained program horses are available. PATH Instructors and Dressage Coaches are encouraged to audit lessons and participate in coach development sessions. A USEF National Classifier will be available for classification. A Sports Medicine Veterinarian will lecture and utilize horses for demonstrations. Veterans may participate free of charge and are encouraged to audit to learn more about the sport, in collaboration with to an Adaptive Sports Grant provided by the Department of Veterans Affairs. Participants will receive a bound manual on a variety of topics with accompanying lectures on Para-Dressage Classification Process, Introduction to Para-Dressage Competition, A Judge’s Perspective on Winning Rides/Video Analysis, Musical Freestyle Tips, Adaptive Equipment & Compensation Aids, Paralympic Military Program, and Common Equine Athlete Soft Tissue Injuries. Sunday’s schooling show is open to symposium participants, but is managed under a separate registration. Below you will find all of the necessary registration forms due Sunday, May 28th. Scholarship support is available for participants and coaches.